The 13th International Young Researchers Workshop on Geometry, Mechanics and Control will be held at the Department of Mathematics, University of Coimbra, Coimbra, Portugal, 6-8 December 2018. This event is the thirteenth in a series of annual workshops that have previously taken place in Madrid (2006, 2007), Barcelona (2008), Ghent (2009), La Laguna (2010), Coimbra (2012), Madrid (2012), Barcelona (2013), Zaragoza (2015), Paris (2016), La Laguna (2017) and Padova (2018). Its goal is to bring together young researchers working in geometry, mechanics and control theory and to offer a platform to present the results of their research to an international audience. 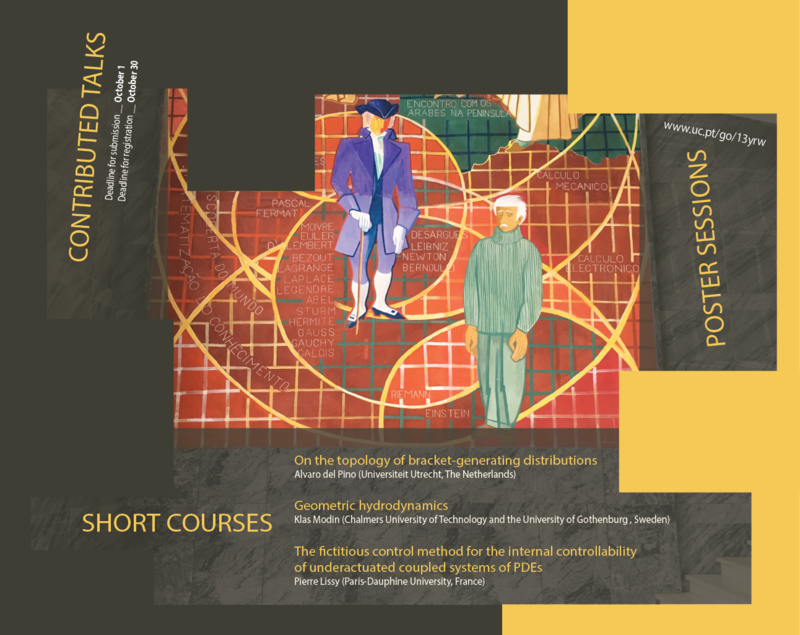 ﻿The core of the workshop consists of 3 mini-courses, of 4 hours each, which serve as an introduction to different topics related to geometric structures in mechanics and control theory. The courses will be at a PhD and postdoctoral level, and it is expected that the young researchers will be, at the end of the workshop, able to access to the recent literature on the corresponding topics. Along with the courses, there will be contributed short talks (30 minutes) and a poster session. Attendance is, of course, open to anyone, but in particular young researchers (PhD-students, recent PhD's) are encouraged to submit a talk or poster proposal. Geometry: (multi)symplectic geometry, Poisson and Jacobi manifolds, Lie groups, Lie algebroids and Lie groupoids. Mechanics: Lagrangian and Hamiltonian systems, non-holonomic mechanics, calculus of variations, mechanical systems with symmetry, conservation laws and reduction, classical field theories, geometric integration of mechanical systems, geometric quantization. Control: optimal control theory, control of mechanical systems, geometric control. This meeting is financially supported by the Centre for Mathematics of University of Coimbra, the Department of Mathematics of the University of Coimbra, FCT - Foundation for Science and Technology, and the Geometry, Mechanics and Control Network.